Following that, they went to another table to receive a cupcake, then to the next table to receive chips and a drink of their choice. 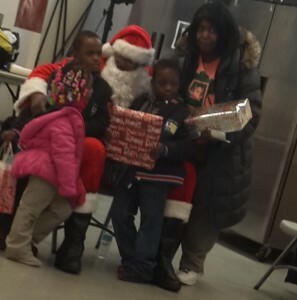 This was a good event, it got everybody in the Christmas spirit. To see the look on their faces after they received their gift made me so happy. “Next year, we can look to expand even more for our next Christmas Toy Drive at Hamilton Park! I’m looking forward to seeing more of Social Sound Productions’ involvement with the community in the future,” stated a volunteer staff member who was helping with the toy drive. This entry was posted	on Thursday, April 2nd, 2015 at 6:05 pm. You can follow any responses to this entry through the RSS 2.0 feed. You can leave a response, or trackback from your own site.